Watching Our Water Ways Environmental reporter Christopher Dunagan discusses the challenges of protecting Puget Sound and all things water-related. 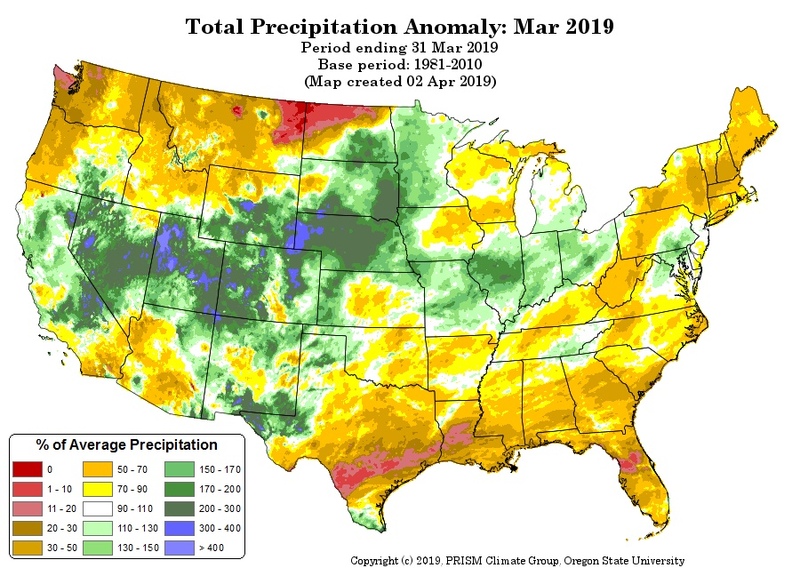 “Average, very average.” That’s how things were going for the first quarter of Water Year 2019, which began in October and ran through the end of last year (Water Ways, Jan. 4). But the second quarter, which began in January, presented an uncharacteristic upheaval, as various portions of the Kitsap Peninsula went their own way. 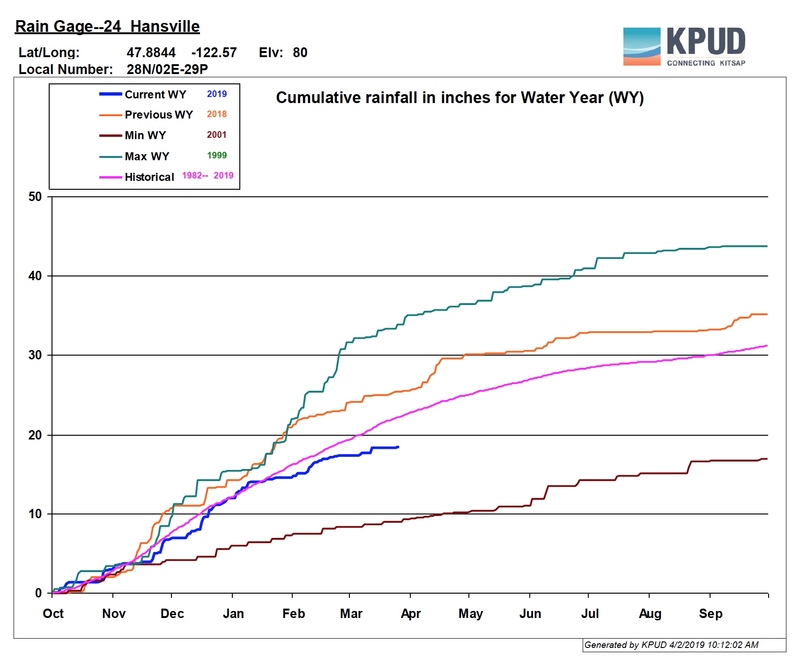 Hansville: Representing the north end of the peninsula, Hansville received 2.5 inches of precipitation in January, well below the 4.4-inch average for the month. February followed with a little below average, 2.8 compared to 3.2 inches. Like January, March was quite low, with 1.1 inches compared to a 3.5-inch average. In the first chart (click to enlarge), you can see this water year’s rainfall total (blue line) slipping below average (pink line). Silverdale: Representing Central Kitsap, Silverdale received 5.9 inches of rain in January, somewhat below the 7.2-inch average. The gap widened in February, when 3.4 inches of rain fell — below the average 4.9 inches. In March, the 0.8 inches of precipitation was even below dry Hansville’s 1.1 inches and way below 5.6 inches — the March average for Silverdale. In the second chart (click to enlarge), this water year’s rainfall has fallen below the average (pink line) and even below last year’s below-average precipitation (orange line). Holly: Representing Southwest Kitsap, Holly was about average for January, with 11.6 inches of rain compared to an average of 12.8. 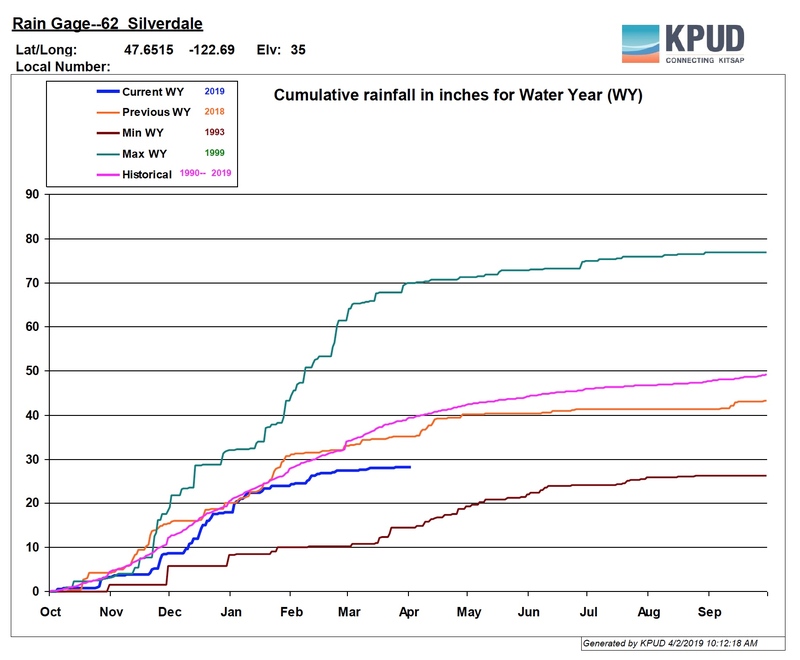 But if the gap was wide between February’s rainfall and the monthly average in Silverdale, it was wider in Holly, where the 4.2 inches of rainfall was just half of the 8.3-inch monthly average. And rainy Holly just about dried up in March, when the area seemed more like the north end during a drought. 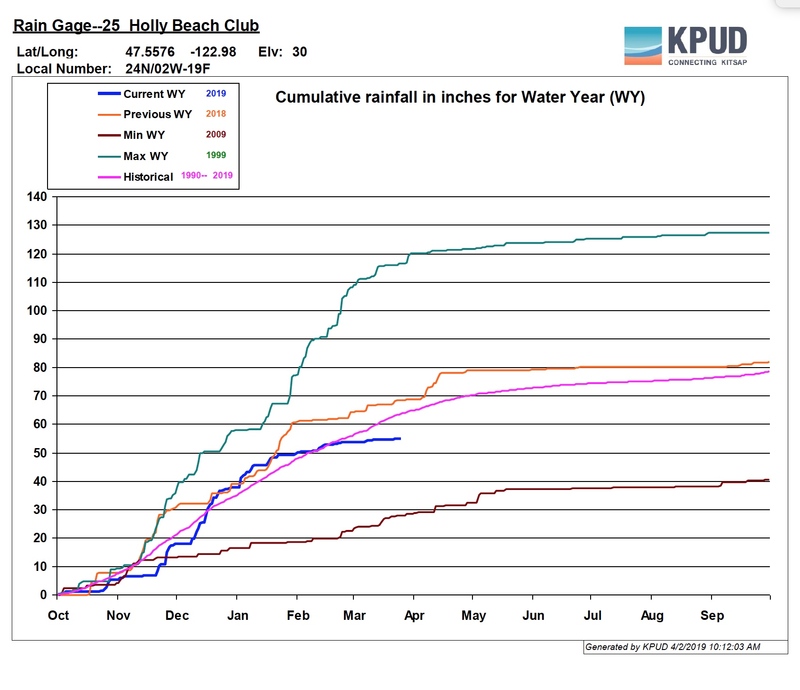 The 1.2 inches of precipitation that fell on Holly in March was just 13 percent of the average 9.1-inches. The chart (click to enlarge) shows the drop from about average to well below average in just two months. I can’t easily describe the mixed pattern across the Kitsap Peninsula, but the lack of rainfall is part of an overall picture for Western Washington, which has been officially declared “abnormally dry” on the Drought Monitor managed by the Natural Resources Conservation Service. As you can see on the map, the entire region was below 50 percent of average rainfall for March. The drought picture could change quickly with anticipated April showers — actually RAIN — that should arrive late tonight or tomorrow morning throughout the region, according to the latest forecast by the National Weather Service. Rain is expected through Saturday, when the weather changes to mostly cloudy with a continuing chance of showers through next Tuesday. 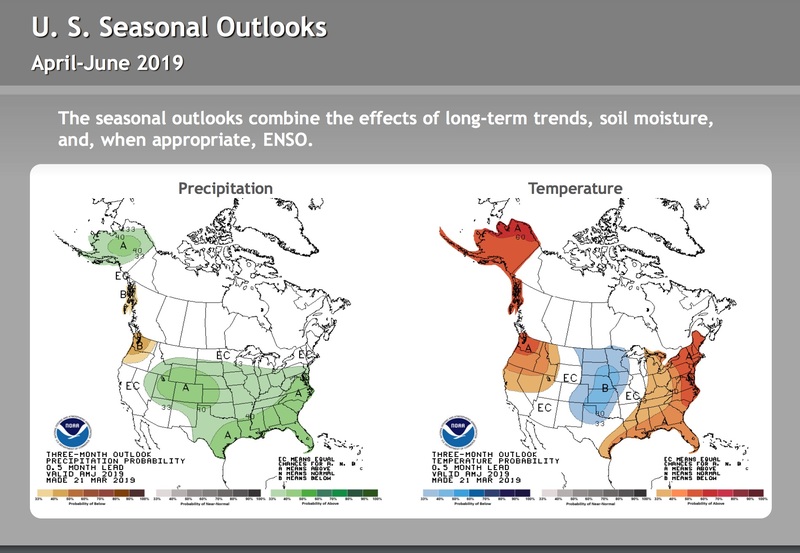 Weak El Nino conditions are expected to continue in our area throughout the spring and into summer, bringing warmer- and drier-than-average conditions to the Northwest, according to the National Oceanic and Atmospheric Administration’s ENSO Adviser and the State Climatologist’s Office. 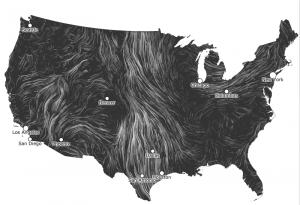 When two computer experts visualized wind speed as a series of moving lines on a map, they created an animated art form that stirs the imagination with its mild hypnotic effects. Click on the still photo at right to call up the animation, known simply as “Wind Map.” The still image was shot from the animated real-time map at 11:40 this morning, showing winds across the U.S. By clicking on a map location, you can zoom in to see an area in more detail. The project is a collaboration of Fenando Viegas and Martin Wattenberg, who are creating new ways to think and talk about data. Inputs for the map are taken from the National Weather Service’s National Digital Forecast Database, which is updated every three hours for wind speed. Extreme wind events are captured in animations on their gallery page. “As technologists, we ask: Can visualization help people think collectively? Can visualization move beyond numbers into the realm of words and images? If you’d like to check out more traditional map depictions of wind speed, temperature, humidity, weather fronts, jet stream and many more weather features, go to wunderground.com. Amusing Monday: A new Earth Day anthem from a comedic rapper?